Effective April 1, 2011 , Section 6407 of the Patient Protection and Affordable Care Act (ACA) established a face-to-face encounter requirement for certification of eligibility for Medicare Home Health services, by requiring the certifying physician to document that he or she, or a non-physician practitioner working with the physician, has seen the patient. CMS implemented the face-to-face encounter requirement of the ACA via the Home Health Prospective Payment System (HHPPS) Calendar Year rulemaking. The Final Rule states that documentation of the face-to-face encounter must be present on certifications for patients with starts of care on or after January 1, 2011 . Office of Inspector General (OIG) work conducted, before the ACA mandate went into effect, found that only 30 percent of beneficiaries had at least one face-to-face visit with the physicians who ordered their home health care. This constitutes new and material evidence that establishes good cause for reopening as required under 42 CFR 405.980(b). Based on this information CMS has directed Strategic to perform postpayment review of Medicare Part A Claims billed for home health services. As you well know, it is most unlike me to be argumentative but I googled ‘home health referral sources’. As it turns out, the CDC information from 2010 is in stark contrast to the information provided by the OIG via Strategic Health Solutions. 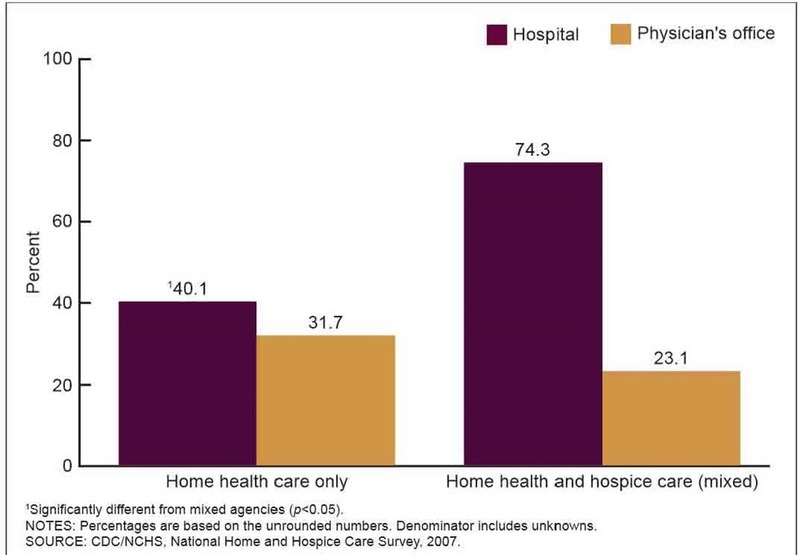 This graph states that providers who only offer home health services have 40 percent of their admissions from a hospital. It says that 30 percent were from physicians but not that they were the outcome of actual physician visits so lets assume none of them were. Sadly, the CDC’s 2010 report references 2007 data. Lets move on to MedPac. They write reports twice a year for the Congress about how much we are overpaid. They increase our confusion by writing about how many episodes are preceded by a hospital stay but their data reflects 2010 so that’s a plus. They say that 27 percent of initial episodes are preceded by a hospital stay and the average length of stay for those patients was 1.4 episodes. That means that 38 percent of patients come from a hospital. Neither MedPac or the CDC differentiate between patients who were in the hospital seen by physicians who did not order their home health and those that did. If a patient was from out of state, it might be that their personal doctor ordered home health or that a hospitalist saved that special joy for the primary physician. This is important because it shows how accurate data could potentially be manipulated to paint an inaccurate picture of our industry. In any event, I can say with confidence that at least 38 percent of patients were seen by a physician because that’s what happens in hospitals. Doctors come write orders, nurses carry out the orders and the cafeteria always closes five minutes before you can get away to lunch. So, we have huge discrepancies between the CDC, the OIG/SHS and MedPac. Who are you going to believe? My money is on the OIG because the CDC and MedPac do not have the authority to arrest me or monitor my email or phone calls. So, after that long and rambling trip through the unfamiliar territory of numbers, we are back at the 30 percent mark referenced in the letter reproduced above sent by the OIG/SHS. That leaves us with some disturbing facts. We have an entity that looks like a RAC, walks like a RAC and quacks like a RAC but is really a Medicare Supplemental Review Contractor. The RAC lookalike has noted that in 2010 providers did not adhere to guidance that was effective in 2011. This non-adherence from 2010 constitutes NEW AND MATERIAL evidence that is being used as grounds to investigate home health care agencies for fraud. And they will find it. And it will not in any way, shape or form improve the care that our patients receive. Note: Pre-Nursing was the only curriculum that did not require math when I was in college which is why I chose nursing as a career. Please feel free to correct any mathematical errors – politely, of course. Are they legit? If we hear from them should we respond? Absolutely you should respond. And don’t wait to begin a campaign to ensure that all the face to face documents coming into your agency meet all standards. They are legit and QUITE active!! We have 5 from Strategic Health Solutions and I have heard their focus is the F2F other than one F2F our charts are a beautiful picture of the necessity for home health. However, one episode is 2011-2012 and of course we all know how many times the F2F has changed. The MD left one item blank and I asked him to please address the issue or I will probably have to pay back that episode. he said NO! SOB I then call TAHC&H and they told me that I can appeal due to the fact that the 2013 requirements on the F2F were not what they were in 2011 and 2012. This is getting to be so not worth being in the business. So what I have told my staff we will NOT do a soc until we have the F2F and that is that. I am a small agency and can’t afford to lose ANY money. I think the MD’s should be held accountable for properly filling out the F2F. They have NO problem writing the referral orders that consist of several pages. All I was asking for was ONE DAMN sentence! I agree with you that the focus of F2F is misguided. The only time I care about a bad F2F is if there is any doubt whatsoever that the patient saw the physician. To the best of my knowledge, no patient has ever benefited from overzealous reviewers throwing out entire claims because a physician documented the diagnosis codes instead of HOW the condition affected the patient.